A round-up of all improvements and changes to the Buzz platform in version 2.0.85, available on January 12, 2017. Currently, some users can sign into Buzz using an email address associated with their user account. Beginning with this release, users who sign in with an email will receive a message asking them to sign in with their username in the future to improve security. Starting on April 1, 2017, users will be able to sign in only with their usernames. 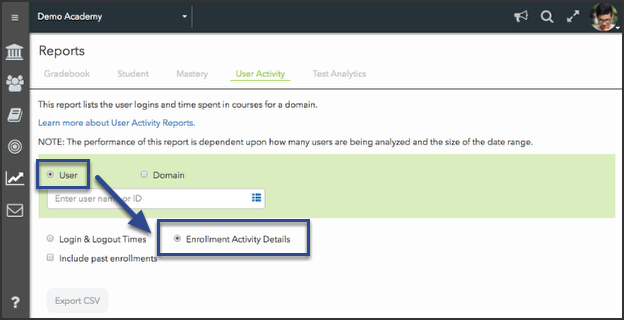 Added the ability to Include past enrollments in User Activity Reports when returning User > Enrollment Activity Details. Added the following three columns to reports that display time spent: Hours, Minutes, and Seconds.Updated the auto-zero behavior, so that only students with Active enrollments can receive them. Updated People page in Multi-Outcome Scoring courses to display outcome percentages instead of weights. Updated Group Assignment grading, so that group grades are given to all students in the group at the time the grade is given. Previously, grades were given to the students who were in the group at the time the activity was submitted. Added notification alerting students that they will lose any work on a dropbox activity if they navigate away from it before submitting. Added notification alerting students that they will lose any work on blog or journal activities if they navigate away from it before submitting. Made many updates to the Teacher and Admin apps to improve accessibility for users with a visual impairment. While many of the updates were under-the-hood, users may notice improved keyboard navigation throughout multiple tools and slight style changes to selected and focused buttons and menu options. Fixed an issue that would sometimes cause dialogs to behave erroneously after printing from the Performance > Grade page when accessed from the Student or Admin apps. Updated course template settings to mark as Public by default. Updated landing page content ordering to reflect the ordering defined in settings. Fixed an issue that would sometimes add unnecessary quotation marks to media tags when editing assessment questions. Fixed an issue that would keep assessment questions from displaying course resource images correctly when there was a comma included in the filename. Fixed an issue that would force users to re-authenticate after 15-30 minutes of inactivity. Updated Choice Activities to be ordered alphabetically by item name. Fixed an issue that would cause the Grade Editor/Activity Grader to fail to display images at times when adding them to feedback. Teachers: How do I create and grade group assignments? How do I use Content Templates?